Columbus Body Works was founded in 1918 by Huel and Morris Wynn. The first location was on Broad Street in downtown Columbus Georgia. In 1925, CBW moved in to a custom-built, state of the art facility located at 1420 1st Avenue. 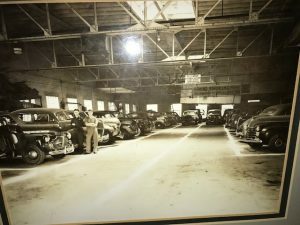 The modern facility had the first “Bear” frame and alignment system which makes CBW the oldest complete body shop in the south, “if not the USA”! In 1962, Morris Wynn Jr. and his mother, Gladys Wynn, purchased the remaining shares from the Huel Wynn family. In 1989, CBW moved to its current facility located at 1919 Veterans Pkwy; one of the only air conditioned body shops in the country. Morris Jr. and his son Philip have been running CBW since 1991. In 2000, CBW opened its second location CBW Northlake in north Columbus. In 2010, CBW Northlake moved into its new 60,000 sq. ft. facility. We partner with CarMax, Kia Auto Sport, AutoNation, Columbus Towing and Recovery, Wimmer’s Towing Service, Enterprise Car Rental, Kar-Tunes, and O’Reilly Auto North Veterans Pkwy.